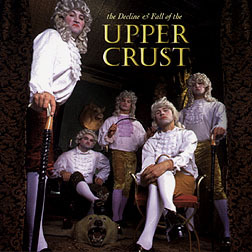 CD Review: The Upper Crust, "The Decline and Fall of..."
A group of thirty-somethings dressed in ruffled Victorian shirts, fancy knickers and powdered magistrate wigs playing rehashed AC/DC may make Emperor Norton hard, but it leaves me flaccid and in great need of a fluffer. If Bon Scott hadn't boozed himself to death, then this surely would have killed him. Somebody, please, give these guys way too much vodka and then lay them on their backs.